Some leaders are born and some are made. We all have God-given talents and abilities. However, great leadership requires a lifetime commitment towards self-education. We must become what we study and lead by example, not just by words. I am always studying the best books I can find on a variety of topics. Some of the most memorable leaders throughout history have been transformational leaders, like Mother Teresa and Martin Luther King, Jr. They had a profound impact on the world. The principles they taught have endured long after their death. Their lives were so meaningful that they changed peoples’ entire worldview. Not everyone can be a transformational leader. That’s why it’s important for aspiring leaders to evaluate their skills and see what kind of leader they are best suited to be. There’s a difference between being a leader and being a manager. All great leaders and managers treat their employees like family members. They pay them better than the competition and give them opportunities for growth. The best employees are those that smile naturally and have a great personality. Those are important traits because personality cannot be taught. If someone wants a job and they’re not smiling or they’re bitter, you can’t change that. As long as people are intrinsically positive, they’ll make a great addition to the team. Every good leader and manager should constantly strive to make people better by always training them. Good managers can reduce overtime while simultaneously assuring people are paid fair wages. Smart leaders are responsible for hiring the right people and coming up with the company’s vision and mission statements, outlining clear goals and communicating them with the team, as well as dealing with rapid changes in the environment. Leadership must focus relentlessly on the customer. They should always be learning, taking classes and making the most of their God-given talents. Managers, employees and customers can’t do that for them. The managers, in turn, should watch out for the business as if it’s their own. Success for them is the company’s growth. Management usually feels great working in companies with a bright future. They function best when they feel like the ownership of the business “has their back”. It’s best to shift most of your time and energy on serving your best customers. There’s a saying that 20 percent of your customers often provide 80 percent of the value to your business. It’s called the “80-20 rule.” I think that in the restaurant business it’s not like 80-20 but more like the “99-1 rule.” That is, 99 percent of your customers are awesome, but you always have the worst 1 percent who constantly seem to be complaining. You have to fire the worst 1 percent of your customers. Otherwise you allow them to destroy morale and slow down service for everyone else. Following these rules is more an issue for management, not leadership. Leadership has more to do with vision and entrepreneurship—starting and shepherding new businesses and creating new industries that did not exist before. Cirque de Soleil is one good example. This Canadian company came in with the revolutionary idea of wanting to launch a circus without animals. At first, people couldn’t understand how anyone could run a circus without animals. At the time, it didn’t make sense. But Cirque de Soleil quickly became one of the top entertainment companies in the world. Its owners became billionaires by asking a simple question: What are the worst parts of circus? Many circuses were abusing animals, so animals were taken out of the equation. Instead of animals, live music with staged acrobatics, grandiose costumes, mystery and magic were brought in. That’s really what people wanted to see anyway, and the extraordinary success of Cirque de Soleil showed that the public supports a business that operates with integrity. There’s a book that I highly recommend for anyone starting a new venture: W. Chan Kim and Renée Mauborgne’s classic Blue Ocean Strategy. This concept looks at what customers want and gives it to them by creating a new industry instead of competing with existing businesses. By creating a brand new niche you can destroy the competition because you won’t even have direct competition. This book teaches you to come up with a concept, do your research, put together the best team you can to implement the idea and get out of the way. Suppose that I have an idea for a new kind of nail salon. In doing the research for it, I ask women what they hate the most about nail salons. It turns out that a lot of them don’t like the fumes. They also don’t like the fact that many of the employees in nail salons can’t speak English. They hate the fact that the seats aren’t very comfortable. “I wish there were wide-screen TVs,” some of the women say. “I wish I could get a nice cocktail.” Others want the best massage chairs available. A few even want private rooms in order to host a special event for their best friends. I also ask what they would want more of and I get responses like: “extended hours”, “dead skin fish treatment”, “friendly and attentive staff”, “better brands of color and organic nail polish”, “fresh-made smoothies”, and “live music spun by a DJ on the weekends.” I would never be able to come up with these ideas on my own. If I started such a concept and it was based on sound market research, I know it would ultimately succeed. I know that if I get such a concept up and running I wouldn’t be the one managing it. That’s because I’m not—and can never be—a manager. I’m the person that usually comes up with the ideas but not the best at implementing them. But even the best idea, the best product, needs to be marketed well and have the right team. It’s safe to say that in business there can be no success without great marketing. Take Apple for example. They display their products on billboards against a background that is a clean, white opaque. In fact, all you see is the product and a tag line—an iPhone 6, say—hypnotizing you to buy it. It’s almost as if the viewer has no choice. Apple is very successful because they’ve made great use of the Marketing Mix, something I hope to speak and teach about soon in the class I’m developing. My future book will also be about this and other marketing aspects of the restaurant business. This book will be the basis for all of my upcoming classes and lectures. For more on that please tune in to my Facebook page or follow me on Twitter in the bio section. The Marketing Mix consists of the “4 P’s of Marketing.” Let’s take a local example of this and see how this works. One local place we have here in LA is Urth Café. Urth Café specializes in organic tea, coffees, and homemade sandwiches, pizzas and salads. They’re known to have a great, European-style atmosphere and quality pastries. They have chosen to market themselves in the upper-fast casual category, and although they do not have full service waiters they often charge as much as sit-down restaurants. Product : Urth Café has a great product in hand-made cakes, a well stocked bakery section, and organic latte’s and teas. They create special dishes for customers and some (although not all) of their menu items are organic, targeting the hip and new health-conscious market. A friend recently told me that although Urth often markets itself as the healthiest choice in LA, very few people actually think this. I have asked many others and people generally like their food and atmosphere, but few say this is the reason they frequent this establishment. Place: Urth is very careful about where they open. They have locations in Beverly Hills, West Hollywood on the trendy Melrose Boulevard, Pasadena, Downtown LA and Santa Monica. These are all within a 4 or 5-mile radius of wealthy clientele (typically making $100,000 or more per household on average). Location is key in the restaurant industry, so be very careful where you open. The place has steel chairs and tables, a lot of wood, and mellow colors such as green and brown. These tones remind people of a garden and sub-consciously emanate a healthy vibe throughout the restaurant. Promotion: Urth has a humble web site and they produce a small news journal. They know their audience and exclusively market to them. Nothing flashy here, just simple and down to Urth. Price: The value is generated through great food, good service, and a nice atmosphere. Don’t expect this place to be cheap. We often spend $70 or more per couple there. Therein lies the secret to their success. The founders must have spent a lot of time formulating the right kind of coffees, teas, and food offerings before coming up with the right formula. They targeted a niche group that enjoys long lunches or dinner with friends in a European café-like atmosphere and is willing to pay a high price for it. It’s important for an entrepreneur to find a niche and create a culture around it. Look at what you’re good at and try to come up with something no one else has created. If we really do what we are good at, it doesn’t even feel like work but life actually becomes fun and full of adventure. Then figure out your target market—the kind of customers you’d like to sell your product to. I have found that once we do this the key players and new team members seem to magically appear and help to attain our goals. Success Today, for example, is the product of the hard work and energy of a few key people. Find your niche and know your audience. Provide great service and marketing. You have to consciously make time for yourself and explore the artistic side of you. We tend to forget the imaginative side of ourselves as we get caught up in our daily routine. I keep myself busy through my artistic projects. When I get too stressed working on our restaurant business, I go to my creative side: painting, artwork, and photography. Make time to socialize, meet people and network. I try to meet three to five new people every day. If you don’t network consciously it tends to never happen. A person’s artistic side is tied to their emotional intelligence. And like leadership, some people are born with better emotional intelligence than others, but everyone can become better at it. The key to improving emotional intelligence is relating to people—talking to them, interacting with them. Taking some psychology classes is also a good idea. Psychology enables us to study what’s behind the human mind and what motivates us as a species. Everyone has a reason for doing things, even if it doesn’t make sense. Respond to their statement and look in their eyes. It’s about letting people talk about themselves instead of talking about yourself. It’s no wonder that the first rule of marketing is to listen to your customers. It’s important to look at people in the eye, especially these days when so many people whip out their smart phones and start talking or texting in the middle of a conversation. That’s rude. Give your cell phone a break and focus on people during conversations. Reciprocity is an important principle to understand and practice. For example, if you immediately ask someone whether they would like to buy a house from you, that person would probably wonder who on earth you are and what you’re talking about, given that you barely know each other. Such behavior turns you into the personification of spam, and people hate that. But if you go up to the person and invite them to a free weekend hiking trip, you’re likely to become friends. Do something nice for someone before you ask him or her to buy something from you. These are the things that lead to symbiotic relationships, and that’s ultimately what we want. As an entrepreneur, I have learned to practice reciprocity simply by showing empathy towards others. I often ask people about their day, their families and their vacations. I’m alert to their upcoming anniversaries. Even when I know nothing about them—or feel they don’t have the time to talk—I just smile at them as frequently as I can. Never underestimate the power of a genuine smile. A leader should always seek wisdom. The wisest thing I can say to the reader is this: Seek first the Kingdom of God and everything else will seem to come naturally. Often we work hard but the fruit never comes. Trusting in the Lord is key. Dikran Iskenderian has a Bachelor of Science degree and a Master of Arts in Leadership from Woodbury University in Burbank, California. He studied at Oxford University in the United Kingdom, where he obtained a certificate in Global Enterprise Management, Organizations, Environments, and Political Economy in 2003. He has also received a professional Certificate in Marketing from UCLA. Mr. Iskenderian co-owns Zankou Chicken, a family owned chain of eight casual fast food restaurants in Los Angeles that is poised for further growth. He is the company’s director of marketing. An avid amateur painter, he has completed many works of art in graphic design as well as traditional media, including acrylic, charcoal, and oil. Art and photography are his lifetime passions. Mr. Iskenderian’s future business plans include the opening of an organic nail salon and a new sandwich shop concept inspired by a trip to Italy. He is also toying with the idea of launching a flower shop in joint ownership with his wife. Mr. Iskenderian loves teaching and speaking. Follow him on Twitter @DikranIskenderi and on Facebook. 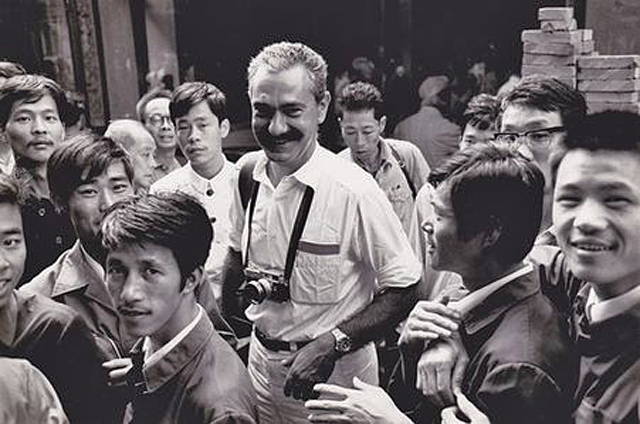 Photo credit: Tiziano Terzani, renowned Der Spiegel correspondent and author in Saigon during the Vietnam War, 1975. With permission from the Terzani estate.